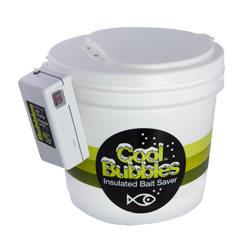 Insulated pail with detachable Bubbles Air Pump. Runs up to 85 hours on 2 "D" cell batteries (not included). Includes 30" of air tubing and a weighted glass-bead air stone. Made in the USA.